The supersharp radio "vision" of the National Science Foundation's (NSF) Very Long Baseline Array (VLBA) is revealing unprecedented details of astronomical objects from stars in our own cosmic neighborhood to galaxies billions of light-years away. Astronomers from across North America and beyond are presenting the results of VLBA research at the American Astronomical Society's (AAS) meeting in Chicago. "The VLBA is one of the most powerful tools in the world for astronomy," said Paul Vanden Bout, Director of the National Radio Astronomy Observatory (NRAO), which operates the VLBA. "It can produce images hundreds of times more detailed than those produced by the Hubble Space Telescope, and that capability has yielded some spectacular scientific results." Examples of VLBA research presented at the AAS meeting include the most accurate measurement ever made of the distance to another galaxy; the detection of our Solar System's orbital motion around the center of our own Galaxy; a "movie" showing the expansion of debris from a star's explosion in a galaxy 11 million light-years away; and a "movie" of gas motions in the atmosphere of a star more than 1,000 light-years away -- the first time gas motions have ever been tracked in a star other than the Sun. With ten giant dish antennas spread from Hawaii in the Pacific to St. Croix in the Caribbean, all working together as a single telescope, the VLBA is "the world's biggest astronomical instrument," Vanden Bout said. The VLBA has been in full operation for more than five years. A pair of sessions at the AAS meeting is devoted to reports of research using the VLBA. In more than 40 scientific presentations, astronomers tell how they used the VLBA to gain valuable new information about nearly every area from the frontiers of astrophysics. Some of those reporting on their VLBA research are graduate students working on their Ph.D degrees. 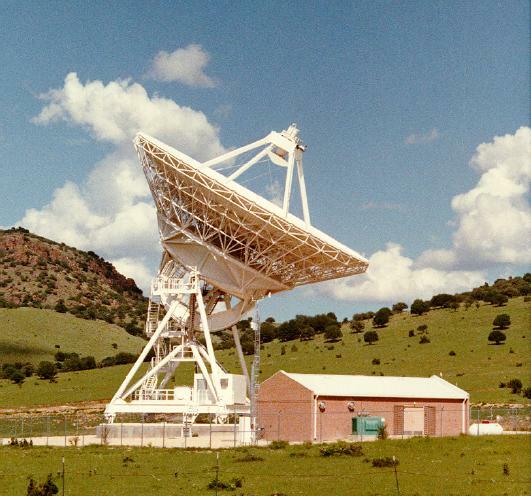 "We are particularly proud that this instrument, one of the world's premier facilities for astronomy, is being used by the next generation of astronomers," said Miller Goss, NRAO's Director for VLA/VLBA Operations. "In addition, we are telling astronomers who have not yet used the VLBA how we can help them use it for their own research." As a national facility provided by the NSF, the VLBA is available free of charge to scientists, based on peer review of their proposed observing projects.